Before I get onto the why's and wherefores of photographing aviary birds, I would like to explain why I am interested in this subject. For centuries we have tried to emulate the gracefulness and ease of a bird in flight, although somehow never quite matching it. The closest I have ever come is from 60 seconds in freefall and 5 minutes or so under a canopy from my skydiving days. There is a saying that goes "Only a skydiver knows why the birds sing". Once under canopy, the silence is only broken by the gentle flapping of the material. The views and sensation of having nothing below your feet is incredible. I feel quite envious that the birds have this sensation every day. I've always enjoyed the calmness that watching or hearing the birds singing brings. I'm by no means an expert on birds. Although I have 4 cousins that are all ornithologists with one of them being published. I remember walking with them on the South Downs near Newhaven in Sussex, England, when I first got into photography. Trying to spot first, and then photograph a Heron in flight was a challenge. With a cheap SLR and even cheaper 200mm lens, this was virtually impossible, it never happened. If you want to photograph birds in the wild, it can require good quality and expensive equipment, lenses and hides etc. But above all it requires patience. Want a crafty, cheap and quick way of adding bird photographs to your portfolio? 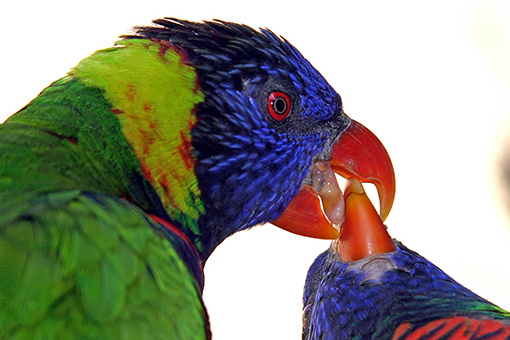 Visit a well run and well stocked aviary and try photographing aviary birds. The benefits here are that there are many different species of bird all within walking distance of each other. Many of which are normally quite used to a human presence. If you want to give this a go, it is great practice, great fun and you may learn something about the wildlife around you on the way. Follow my tips on photographing aviary birds and then go and try for yourself. When photographing aviary birds in particular, try to avoid putting the bird in a stressful situation. Try to avoid cornering it, or endangering its nest for example. Remember, you are visiting their world, they don't owe you anything. Having been in captivity for a while, most birds should be used to human presence, but don't push it. I noticed this strange and wonderful bird (Hornbill) jumping around in the bushes, so I got a bit closer and down on my knees. As I was shooting, it started jumping towards me, now I don't know if it was performing a mating ritual or protecting it's nest, but I felt as though I was invading it's space so I left it alone anyway. By the look on his face and the size of his beak, I wasn't going to argue! With digital I would suggest that for one, you have an SLR camera with 16mp or above. Maybe a compact digital with around 20mp +. If you are thinking of cropping. Remember the compact digital cameras have smaller sensors, so you will need more resolution. The more you crop, however, the less resolution and quality you get, so not too much. The following examples show how you can effectively crop a photograph to give the effect that you are closer, without losing quality. If you need to up the quality later on, "Genuine Fractals", the add-on for Photoshop, is superb. However, sometimes the aviary birds are so used to being around people, you really can get in quite close. This parrot allowed me to get within 10 feet using a 135mm macro lens. The original is pin sharp as I was able to really take my time, and a few shots. Inevitably, when photographing aviary birds, you will have distractions in the background. Things such as wire meshing to keep them in, or bins, poles or people aimlessly wandering into your photograph. One way of losing this is to open up your aperture to around F5.6 or F4. This gives a nice shallow depth of field. Be careful though as too shallow and you will have difficulty in keeping the bird in focus. Like it isn't hard enough already! Also try moving slightly to the left or right just enough to "hide" the distraction out of view or behind the bird/s. If you hadn’t noticed, birds are fast and the smaller they are, the faster they are. Even a perched bird or "sitting duck" (excuse the pun) normally make unexpected movements. You will need slight of eye and a fast shutter speed. A minimum of 250th/sec or preferably 500th/second are best, especially if the bird is flying. This will normally, depending on the light, mean a large aperture which goes quite nicely with my previous point! It helps if your camera has fast auto focus too. You will not be able to successfully focus manually on a bird in flight. If you are photographing aviary birds of a larger nature, they tend to be slower and more predictable. Therefore you can take your time, but still be ready for anything. If your camera has it, put it on AI Servo, this will track the bird as it moves. Photographing aviary birds doesn't need to be rushed. If you have the time, waiting (sometimes a long time) can bring its rewards. You need to be patient if you want to capture something different. A bird will see you as a predator and will watch you for as long as it takes before it becomes more at ease. Once this happens, the bird will go back to its normal pattern of bathing, feeding or even playing. This is when you should be ready. Where I used to live we had a "Swan Lake" (excuse the pun again), in an abbey. I remember seeing them having a stretch at the end of preening. I waited for about 10 minutes and as I expected it started stretching for a few seconds and I managed to shoot about 20 photographs. If you know what birds you are looking at photographing, read up on them individually. Try to find out their habits, characteristics and breading seasons. These can all help make your task a little easier. Check out photographing aviary birds using "Birds in Europe" at Birdlife.org for inspiration. The beauty about photographing aviary birds is that you don't have to spend a fortune on super-telephoto lenses. You can get decent shots with a compact digital camera with a half-decent zoom. However, as the action can be fairly swift, the "shutter lag" that most of these cameras adopt, and small sensors may hinder your progress. I would recommend an SLR (single lens reflex), film or digital. One with AI servo (intelligent focus) capability and if digital, 16 mega pixels or more. It is also good to have a reasonable fire rate such as the 7 frames per second on the Canon EOS 5D Mark IV. You can’t always rely on your super fast shutter finger to get that shot in one go. Firing a burst of photos as a bird takes off can ensure at least one is well focussed and correctly composed. Get the best lens that you can afford. As you are never going to be too far from the subject, a mid-range telephoto or zoom will do. I use the Canon EF 70-200L IS USM (expensive) with a 2x converter. But I have also had great results with a smaller EF 28-135 IS USM (cheaper) lens. As long as the lens is good quality and has at least F4 on the aperture and up to 200mm range, you should be ok. The main thing is to practice, practice and then practice.